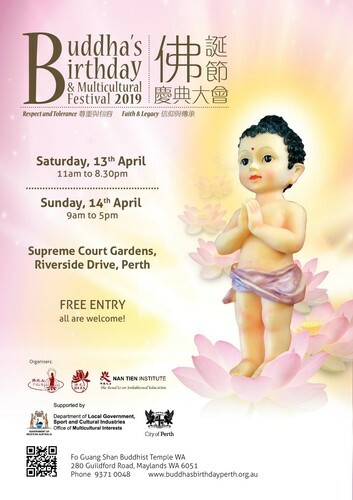 Join us at the Buddha’s Birthday & Multicultural Festival, in celebration of the birth of Sakyamuni Buddha, the founder of Buddhism and the diversity of Australia. This year, we will be at a new venue, the Supreme Court Gardens, with its newly renovated grounds. The festival will be buzzing with activities during the 2-day event to spread the message of ‘Respect & Tolerance and ‘Faith and Legacy’. We hope to promote harmonious co-existence among people, and provide visitors an insight into Buddhist teachings and philosophy as a way of life to bring about peace and happiness. It is a family friendly, smoke-free and alcohol-free event which provides the community and people of all ages an opportunity to see, hear and taste a variety of experiences through ceremonies and rituals, cultural displays and exhibits, vegetarian food and multicultural entertainment. For full details and program of activities, please visit Buddha's Birthday and Multicultural Festival website. This festival is proudly supported by the Office of Multicultural Interests and City of Perth.